Are you ready to Discover "South Vietnam"
South Vietnam combines history, culture and urban life with beaches and outdoor adventure, Travellers may enter South Vietnam by land, river and air. Tan Son Nhat International Airport (SGN) is one of the two most important airports in the country, and services Ho Chi Minh City (Saigon). Travelers in neighboring Cambodia often choose a different means of travel, however. Overnight buses run from the Cambodian capital of Phnom Penh to Ho Chi Minh City. Daytime travellers can use river boats to go down the Mekong into South Vietnam to Chau Doc in the Mekong Delta. From there, visitors may either continue on to Ho Chi Minh City, explore the Mekong Delta area by boat or cruise, or travel to the island of Phu Quoc by sea ferry. The single most popular trip out of the city takes in one or both of Vietnam’s most memorable sights: the Cu Chi tunnels, for twenty years a bolt hole, first for Viet Minh agents, and later for Viet Cong cadres; and the weird and wonderful Cao Dai Holy See at Tay Ninh, the fulcrum of the country’s most charismatic indigenous religion. While it’s possible to see both places in a day (indeed, most people do), be prepared to spend most of the day on the road. 1 day starts at $ 99 - Join in group All incl. Food + Drinks + Vespa + Tour guide + Helmets + Raincoats + Insurance + Experienced drivers Unique Vespa Motorbike tour | Saigon used to be the capital of South Vietnam and was renamed Ho Chi Minh City after the war. However, locals still know the city as Saigon. The city is no longer an official capital, yet it thrives as the country’s largest city with over 8 million citizens. Saigon is a buzzing hub of culture, cuisine, and business. Our Ho Chi Minh City tours give you local insight to this bustling city, or you can even escape the city limits into the Mekong Delta. We offer serveral departures per week but places fill up quickly so please book in advance! Check availability now: Contact us Are you ready for the "A Glimpse of the Mekong Delta Experience"! Introduction Take A Glimpse of the Mekong tour to go beyond the concrete jungle and away from the hustle & bustle of the city of Saigon while stopping to see how the locals live & eat in the countryside. Day 1: Ho Chi Minh City - Mekong Delta Go where no other tours will take you on this Mekong Delta day tour. Go beyond the concrete jungle of Saigon and onto the back roads and red dirt trails of the countryside. You will cross dozens of bridges over many river tributaries, ride on a river ferryboat, and cruise through a vibrant bustling riverside market. Zoom through the bright green rice paddies while stopping to tour local cottage industries such as incense making & rice wine production, and sample some Vietnamese specialty food and drinks. Feel a world away from the city on this off-road ride. This tour requires an adventurous spirit and a strong backside. 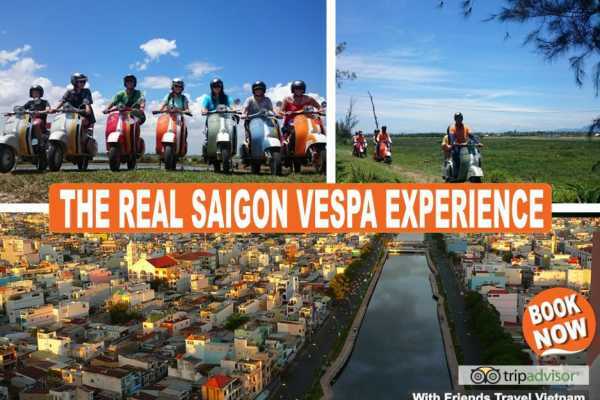 Experienced and skilled riders can drive their own Vespa or automatic scooter on this Mekong Delta day tour, or you sit back & relax on the back of a restored vintage Vespa while we take you through the beautiful scenery. The tour comes to an end with lunch at a restaurant where you can cast a line and catch a fish while you enjoy a cold beer in the shade. We run daily from 8:00 AM - 2:30 PM. Add a cooking class with traditional Vietnamese dishes or upgrade your experience to our 2 day,1 night Wild-Life Mekong adventure? Contact us at info@friendstravelvietnam.com and we'll make it happen! CHECK OUR LATEST PROMOTIONS & OFFERS: Last Minute Deals | Happy Birthday Discounts | Promotions Friends Travel Vietnam offer discounts for groups of 4 or more, we encourage groups to book with us by offering discounts for group bookings. For detailed information for bigger groups, prices and tickets, please contact us! 1 day starts from $ 99 - Join in group All incl. Food + Drinks + Vespa + Tour guide + Helmets + Raincoats + Insurance + Experienced drivers Unique Vespa Motorbike tour | Saigon used to be the capital of South Vietnam and was renamed Ho Chi Minh City after the war. However, locals still know the city as Saigon. The city is no longer an official capital, yet it thrives as the country’s largest city with over 8 million citizens. Saigon is a buzzing hub of culture, cuisine, and business. Our Ho Chi Minh City tours give you local insight to this bustling city, or you can even escape the city limits into the Mekong Delta. We offer serveral departures per week but places fill up quickly so please book in advance! Tour Runs Nightly 6:00pm – 10:00pm. 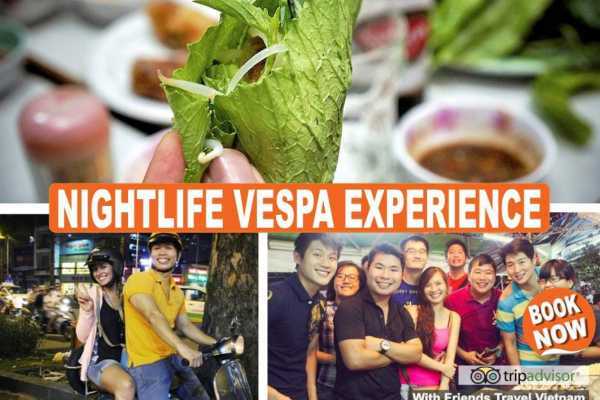 Check availability now: Contact us Are you ready for the "Nightlife Vespa Experience "! Introduction Part night excursion, part street food adventure. Experience Saigon nightlife the way locals do, all from the back of a vintage Vespa scooter. Day 1: Ho Chi Minh City - Mekong Delta To start off this Saigon night tour, enjoy drinks at our Vespa themed café, Café Zoom, to watch “as the world goes by” (as said in the Lonely Planet guide book). Throughout the night, try a variety of food and drinks at local restaurants and samplings of Saigon’s best authentic street food. We’ll also go to a Vietnamese-style coffee shop with special live music, and then wrap up the evening at an exciting bar where the new generation of Vietnamese unwind and flaunt their unique styles. Guests ride pillion behind our drivers to enjoy and experience the Vietnamese night life with friends. This tour includes free flowing drinks and all you can eat, so come with an appetite. Kids? No worries! We can adjust this tour to be more kid-friendly. CHECK OUR LATEST PROMOTIONS & OFFERS: Last Minute Deals | Happy Birthday Discounts | Promotions Friends Travel Vietnam offer discounts for groups of 4 or more, we encourage groups to book with us by offering discounts for group bookings. For detailed information for bigger groups, prices and tickets, please contact us! 1 day starts from $ 29 All incl. Transport + E.S. Guide + Fees + Water The beautiful Cao Dai Temple and the invisible miracle of Cu Chi! The Great Holy See Temple, built in 1926, is considered one of the most striking structures in all of South-East Asia. It is the headquarters of the unique Cao Dai sect, a religious hybrid, incorporating Buddhism, Christianity & Confucianism. Above the entrance is the all-seeing holy eye, a symbol of the sect. Visitors will attend the midday ceremony extravaganza, to witness the daily mass held by the Cao Dai followers which is a fantastic experience. Located 60km from Ho Chi Minh City, Cu Chi is now a popular spot for both Vietnamese & foreign tourists alike. The 200km network of tunnels became legendary because of their vital role in the war. In their heyday, the tunnels were fully functioning underground cities including numerous trap doors, specially constructed living areas, storage facilities, weapons factories, field hospitals, command centers & kitchens. 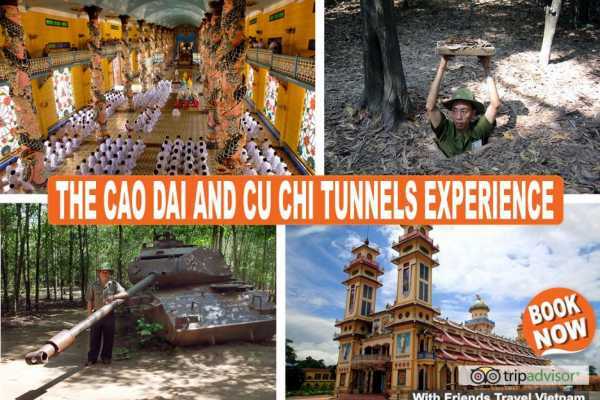 Are you ready for "The Cao Dai and Cu Chi Tunnels Experience"! With this trip, we have built our reputation! CHECK OUR LATEST PROMOTIONS & OFFERS: Last Minute Deals | Happy Birthday Discounts | Promotions Friends Travel Vietnam offer discounts for groups of 4 or more, we encourage groups to book with us by offering discounts for group bookings. For detailed information for bigger groups, prices and tickets, please contact us! Brief Itinerary Day 1: Ho Chi Minh City - Cao Dai - Cu Chi Tunnels - Ho Chi Minh City Our mini-van departs around 8am towards the Cao Dai Temple. You will be guided around, informed by our tour guide about the fascinating history of this religious area and there will be time to explore the Temple by yourself. We continue our tour in the afternoon and before entering the tunnels visitors can watch a short introductory video, showing how the tunnels were constructed. You will be guided around the former heart of the tunnel network afterwards. You’ll spend the next hour exploring the tunnels before having a refreshing tea and cassava, which was eaten by the guerrillas during the war. See the traps they used, experience how it is to be in one of their small shelters, try to find a hidden tunnel door yourself and wonder around the heavily bombed area. It's even possible to shoot with an automatic weapen, like the AK47 or M16, if you want to. Any question will be answered by your English speaking tour guide. We'll be heading back to Ho Chi Minh City in the late afternoon.